Mauricio Pochettino admits Tottenham's transfer market mistakes forced him to make the painful decision to leave promising defender Juan Foyth out of his Champions League squad. Foyth has broken into Pochettino's side in recent weeks, starting the last three Premier League games and scoring the winner at Crystal Palace. But the 20-year-old Argentine will miss Wednesday's do or die Champions League clash with Inter Milan as he was not included in the club's 25-man squad for the tournament. Foyth was omitted as Tottenham have 20 "non-locally trained" players in their squad and are only allowed to name 17, so he was one to be sacrificed. Tottenham boss Pochettino concedes that decision was a consequence of the club's inability to sell any of their foreign players or sign any English replacements in the close-season. "I'm so disappointed from the beginning because it's not only him but Georges-Kevin N'Koudou and Vincent Janssen are out of the squad in the Champions League and that's so painful," Pochettino told reporters on Tuesday. "It's a mistake that we made that at this level of football we cannot repeat again. For different reasons we need to find solutions before the start of the season. "I told you we need English players, but it was impossible. Of course now that is the problem and it's so painful to have players out of the list. "Now we're going to finish the group stage and then we hope in March we can do a new list and include him in the list for the Champions League." That won't be easy as the Italians have already beaten Tottenham in the group stage at the San Siro. 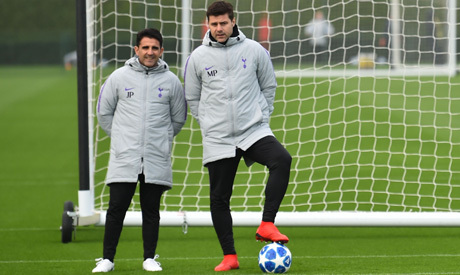 Pochettino's team will go out if they fail to beat Inter at Wembley and he has called for a big performance from Dele Alli to take the qualification battle to the final group game in Barcelona next month. Alli scored in Tottenham's impressive win against Chelsea on Saturday and Pochettino admits the England midfielder performs as his best when the stakes are highest. "You know Dele, he loves a challenge, every single game," he said. "He is a winner, his mentality is that he gets bored quick when he doesn't feel the pressure and challenge. "But when he is with opposition and with pressure he is unbelievable. He is a competitor, he loves this type of game, he loves to compete in a difficult situation." "It is going to give us hope or give us a different reality that we cannot fight to get through," he said. "It is a decisive game, it is a must-win game. "When people say something is going to be difficult, I am so excited to show it is possible to do."